14 X 6 Stamped Steel Baseboard Return - White Discounts Apply ! Baseboard return air grilles are made of sturdy stamped steel construction. These 14 x 6 white vents have a strong enamel finish for durability. 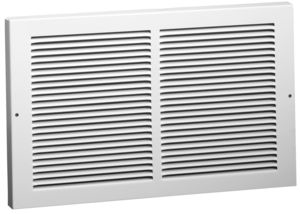 Baseboard return air grilles are a great option for updating your current vents or for use in new construction. 14 x 6 White vents offer a quality product at a great value. Baseboard return air grille fin spacing is 1/3" at a 20 degree angle. ***Hint: The industry standard is to order using the actual hole opening size and not the white vent faceplate size. This baseboard return air grille will fit a 14 x 6 inch hole opening. Actual Faceplate Dimensions (LxH): 15 3/4 x 7 3/4 inches. These white vents are also available in other colors and sizes. Baseboard return air grilles are an incredible value, order today!